The maintenance of property and physical assets is a complex and time-consuming task that requires organisation and planning. Multi-purpose sports halls take some punishing traffic throughout the school year and require constant attention. The life expectancy of sports surfaces ranges from 15 to more than 50 years, with various options available to suit a multiplicity of sports. Each substance requires a material-specific maintenance and replacement regime – and all will underperform if this is not adequately managed. Sharing the mantle with Christmas and New Year, summer holidays in Australia can be a difficult time to get things done; thinking ahead is imperative. 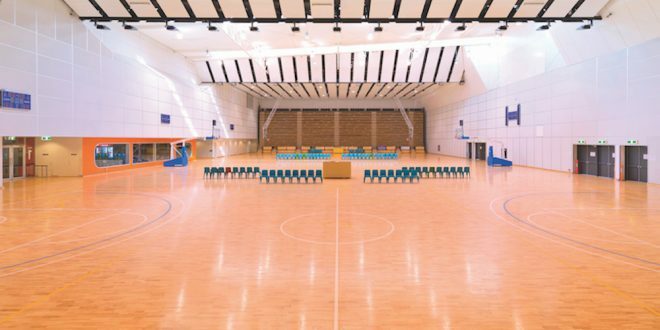 School News consulted Rik Allen from Nellakir, for the low-down on a maintenance schedule for existing sprung timber floors, and what’s involved with installing new timber flooring for your sporting facility. Sprung timber floors require a simple re-coating every 12 months to maintain the high level of surface quality and slip resistance – while a complete re-sanding should occur every seven to 12 years. Long-range upkeep will eventually involve removal and replacement. “After a specified period of time, which will depend on usage, upkeep and wear and tear, sports flooring will need replacing,” Mr Allen advised. Receiving monitoring and maintenance on both flooring and seating from the original installer means “all repairs to stadium seating are based on original specifications, ensuring required integrity and functionality”.